Every year, when cherries are in season, I try to do cherry and strawberry picking, except last year because we went too late and all of the cherries were gone. Well, who's to blame when cherries are out on late July? Not to mention that I completely missed the cherry season last year due to I don't remember what. I just know that I didn't eat enough cherries as I wanted to and my biggest disappointment is that I didn't get the chance to play with them in the kitchen! 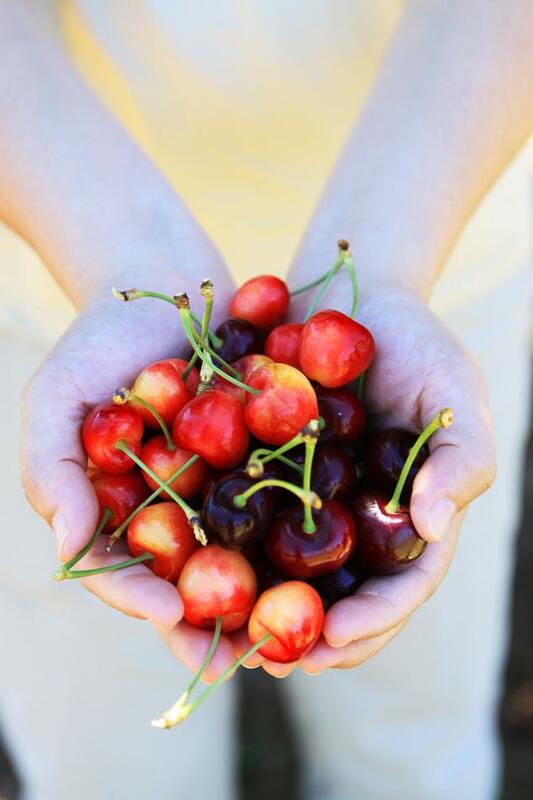 You see, cherry season is very very short, from Mid May-mid June, maybe late June if you got lucky, but that's about it. This year, I came more prepared. 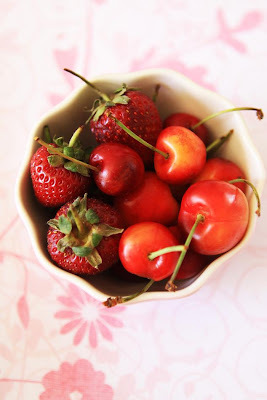 I've already made a list of the cherry desserts I wanted to make as well as some strawberry desserts, and off to cherry and strawberry picking earlier. Our farmers' market has abundant of them, but it's the experience that you're missing when you're buying off of the market. I'm not complaining though because I completely rely on those cherry and strawberry stands in the market every week and they have the sweetest and the most amazing fruits I've ever had. It was particularly hot that weekend when we went, and quite windy too at the farm, which made it better because it didn't feel as hot as I thought it would be. We were off to a good start with our buckets full of rainier and bing cherries, I took my niece with me too and she enjoyed every second of it, she had her own basket from home, and she even wore cherry-printed shirt! Now, that's the spirit! 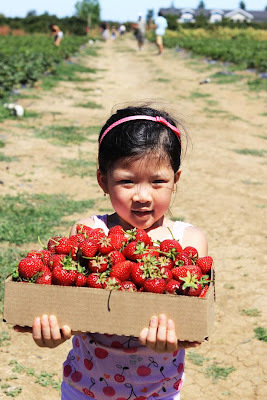 It was scorching hot though when we started the strawberry picking, but it didn't stop us from getting the most beautiful and the sweetest strawberries! It was so tempting to munch on them when we're picking it, but we had a good self-control :). 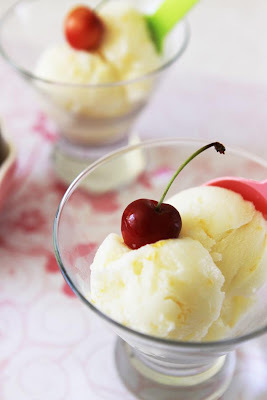 This hot weather makes me crave for something cold and refreshing, and that's when sorbet comes to mind. Plus, I've been dying to use my brand-new ice cream machine I got from my birthday this year (thanks guys!). It would be perfect if I made strawberry sorbet, but not this time. Don't worry though, it'll come soon once I gather my last ingredient for it :). 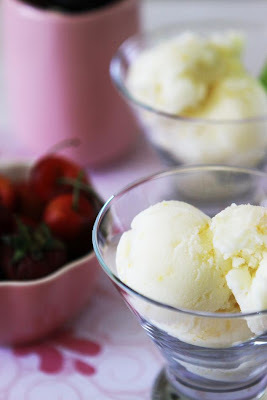 I don't want something fancy this time, just something simple, cool and maybe lemony, and that's when I spotted this from one of my favorite bloggers, how perfect! I had some leftover buttermilk from the baby shower event that needed to be used up lots of meyer lemon juice and zest in the freezer, so everything was ready. Making this sherbet was a breeze, as it only has few ingredients. I reduced the amount of the lemon juice a little because it was too tart for me. It turned out GREAT! just everything I wanted, simple, tangy, cool, and very refreshing, with some lemon note to it. Ahh... I couldn't stop eating the ice cream while it's still running in the machine, it was so good. 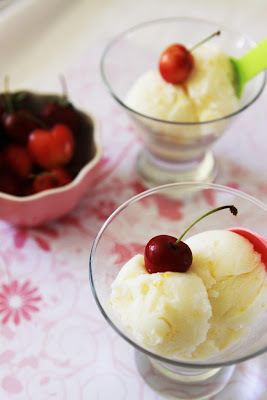 This is exactly what I would crave for on a hot sunny day. The taste reminds me of the original flavor of frozen yogurt at its best with lemon flavor. 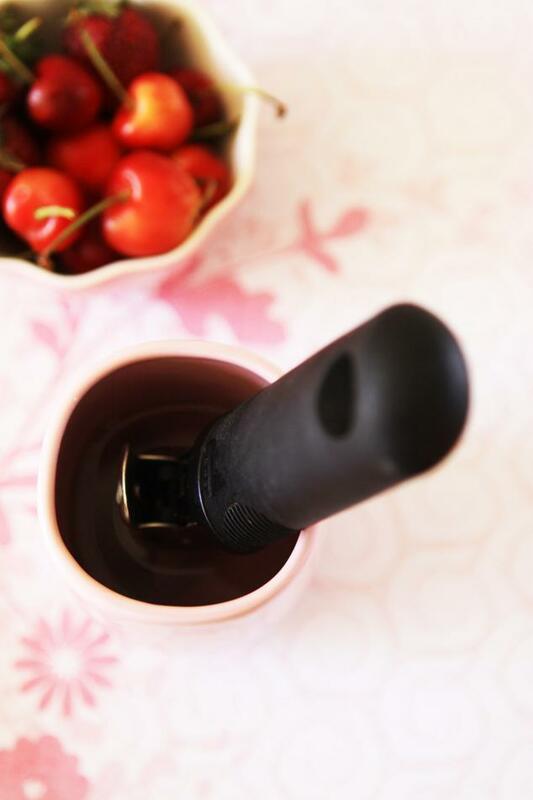 I'll leave this post at that because now, I have to start pondering what I should make with all those cherries and strawberries in my fridge :). adapted from David Lebovitz's "The Perfect Scoop"
Combine together the water, sugar and lemon zest in a saucepan and bring it to a gentle boil (I like to rub my zest with the sugar to release the lemon oil for more lemony flavor). 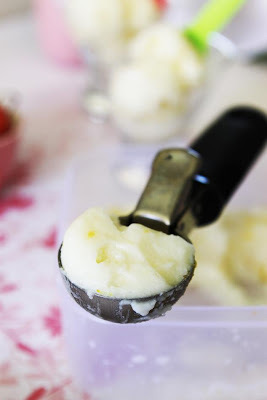 Add the buttermilk and the lemon juice to the sugar syrup and churn it in the ice cream machine. bagi yah cie... looks good! I adore these photos! 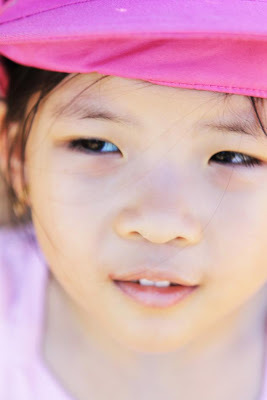 Such beautiful and gorgeous photos. And the fruits! I wish it was summer already, so I could run out there and go pick strawberries and cherries! This looks so rich and delicious! Summer really is all about sherbet!! I'm planning on making some this weekend. 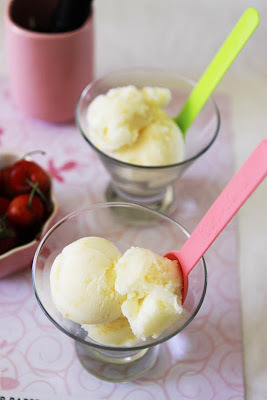 Since I have some fresh watermelon, I might try Summertime Delight Watermelon Sorbet. Or I might run to the supermarket and grab some lemon to try yours!